💰The big five report. Amazon in depth. The differing paths to success. 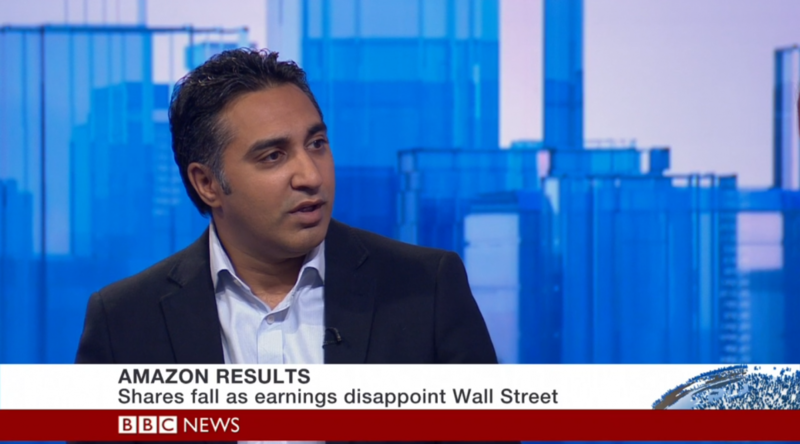 I spoke briefly on the BBC (video below) on the Amazon results but with so much happening at Amazon I’ve expanded on it further. In the lead up to Amazon’s results, the analysts were super positive. But like Google, Amazon has never really respected the stock market’s quarterly results cycle and this quarter’s results was a reminder of this. The investment over the quarter meant that earnings were 0.40c per share, instead of an average $1.41 per share. They didn’t just miss expectations, they completely ignored them. Why were we surprised? The money is being invested predominantly in three major areas – expansion into Asia, delivery and their video service in advance of the key Christmas period. This was Amazon for the most part making a bet on their next quarter’s numbers and beyond. The margins at Amazon are thin but when you look underneath the covers, Amazon Web Services, their cloud server platform used by companies globally to host apps, websites etc. are performing extremely well and are increasingly profitable. It is a $10bn business and grew a healthy 42%. They completely disrupted the provision of servers to businesses and are continuing to lead the market. Microsoft’s presence here is starting to be felt now – they previously grew over 50% and whilst they are still far and away the leader, Microsoft has the arsenal to go toe to toe with Amazon. Most talk about Facebook’s revenues focus on its ads on the right hand side inside Facebook. Social advertising I suppose you could call it but this is really just standard targeted advertising which has been around for over a decade, albeit thanks to the nature of the social network the targeting is not bad. Like all fixed position advertising though, users train themselves to mostly screen out these ads. Not bad for branding, poor for direct response. Sponsored Stories is the real innovation though. In stream, it is in the stream of information that users are actively scanning. Much better for brand impact and also better direct response. Even better for Facebook, this can work in mobile as well – and shows up in its most recent results – 50% of revenue from Sponsored stories came from mobile. Like all interruptive advertising though, getting the balance right is key – with complete control of the platform though, Facebook can easily identify the right balance and quickly. Facebook could also potentially alter the frequency by geography and device as well – I am sure both these factors have an impact on how many ads you are willing to endure. Wrote an article for the DMA’s Infobox newsletter, which was sent out today. It looked at how social networks are increasingly using email to push people back into their networks. This is no surprise, as email is very much the glue that connects channels together.